In order to book BMW M5 from Hertz you need to call their reservations. Reservation cannot be done online. M5 reservation will go to “request” process which can take couple days. I dont know which locations BMW M5 is available but I assume biggest Airports and some City locations. Example prices (your price may vary depending on your possible CDP discounts etc). CDW is highly recommended and not really sure if they would even rent M5 without CDW. Deductible for BMW M5 without CDW is 85.000 euros (around $110k USD). So I doubt that any credit card coverage would cover it. 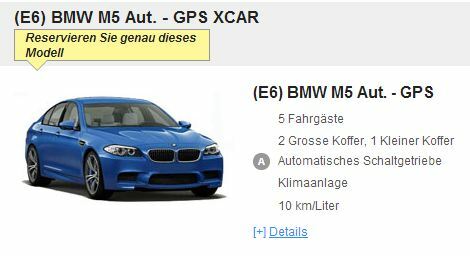 BMW M5 list price in Germany is 103.500 eur without options. I think Hertz had some mistake rates at first since they included 500 km per day (at least they claim it to be mistake rate).